This continuing education course introduces a proven plan for developing power, strength, explosiveness, quickness, and agility. It features 147 exercises and numerous programs to use with athletes and strength and conditioning enthusiasts. 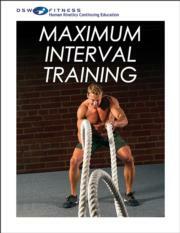 Performance-based high-intensity training programs like P90X and Insanity have exploded in popularity over the past few years, and the Maximum Interval Training continuing education course builds on that concept—intense exercise periods combined with brief bouts of recovery—with a range of training modalities to deliver a more effective muscle-building program to clients.